Military Burn Pits: The New Agent Orange? A friend recently commented that her brother, who served several years in the military in Afghanistan, seemed to always have a cough and nasal congestion when they spoke on the phone. "Oh, they're always burning something here," was his explanation. What he didn't realize was that a serious environmental hazard may have been smouldering as well. It's no secret that US military operations can be harmful to the environment. US military presence and interventions often leave environmental health problems for both soldiers and the local population. Prominent examples are pollution from the plutonium at Hanford used for the bomb dropped on Nagasaki, dioxin in the herbicides used in Vietnam, and polluted drinking water in Guam. But these problems are not limited to past military adventures. In recent years, burn pits--a disposal method used for waste generated by military bases and personnel in Iraq and Afghanistan--have been under scrutiny for their appalling effects on human health and the environment. Picture huge open-air or shallow pits filled with every type of trash a military base has to dispose of: electronics, weapons and munitions, biological waste from combat and medical care, plastics from many sources, human waste, and rubber tires - with jet fuel often used as an accelerant. 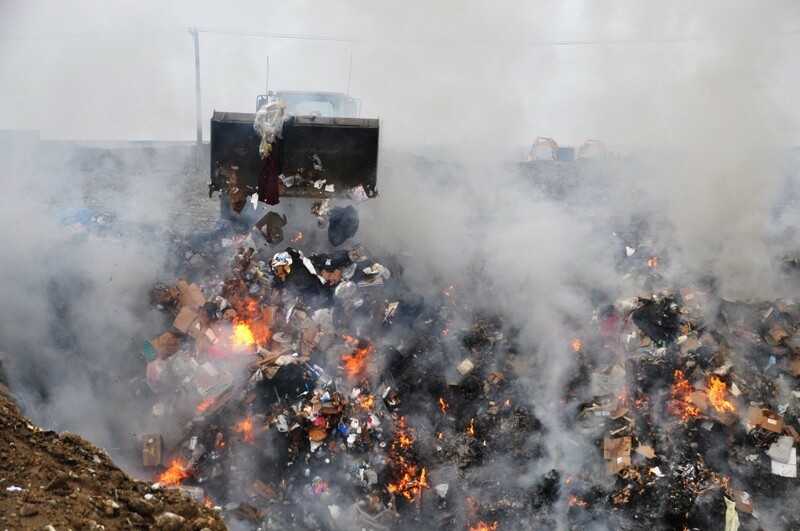 The Department of Defense estimates that 30 to 40 tons of solid waste are burned this way at large bases--every single day. In an era of uber-sensitivity to environmental pollution in the US, why is this allowed? Because these are war zones, where there is little to no waste-management infrastructure and even fewer regulations preventing their use. Health and environmental complaints led to new U.S. laws restricting burn pits in Iraq as of the end of 2010 -- but burning continues unrestricted in Afghanistan, with nearly 200 military sites using that method as of 2011. Military burn pits are not just an annoyance. Burn pit emissions have been shown to contain toxins that can threaten health even in small exposures: materials such as dioxins, volatile organic compounds, particulate matter and many more. As one might expect, breathing that smoke has been linked to serious medical problems, and massive amounts of open burning often means that neither military personnel nor local residents can avoid inhaling it. Reports from the soldiers themselves show that they've been worried for for several years about the health effects of burn pit exposure. On the web sites Burn Pits 360 and Burn Pits Action Center, soldiers share their accounts, many of them quite tragic, of living in close proximity to the pits and how that exposure has since affected their lives. In 2014, the Veterans Administration developed an online survey where more than 28,000 returned soldiers voluntarily reported their exposure to burn pits and possibly related health problems in Iraq or Afghanistan. The results, presented in a June 2015 report: fully one quarter of the soldiers who were exposed to burn pits as part of their work reported that they now have a new diagnosis of one or more serious respiratory problems, compared to 17% in those not directly exposed to them. An even more shocking 37% of those who worked with burn pits report that they now have high blood pressure, compared to 28% in general service. As with most public-health issues, establishing a firm causal relationship between burn pits and health problems has its challenges. U.S. service members in combat situations have long been exposed to many harmful conditions, and health problems that might emerge years later from those exposures are difficult to link back to their source. But the picture that emerges from the VA report strongly supports the soldiers' perceptions that the burn pit smoke may well have caused them long-term harm. What has been the response? The Department of Veterans Affairs web site continues to state: "At this time, research does not show evidence of long-term health problems from exposure to burn pits." Rather than develop a stronger information system, Congress dropped burn-pit research from its list of Department of Defense peer-reviewed medical programs for 2016. It will now be much harder to get evidence of the harmful effects. Veterans seeking disability for any service-related medical problems need to go through a lengthy process and their claims are handled "on an individual basis." A backlog of several hundred thousand VA claims is not uncommon. Some ask: is this the new Agent Orange? The likely effects of the burn pits on Iraqi and Afghan citizens living near them is another critical concern. Anyone living near or downwind from the bases has constant exposure to these emissions over what can be many years. There appear to be no studies of the effects of burn pits on Iraqi or Afghan civilians - no surprise. But it's likely that the overall health effects for them are disastrous, and to date we have taken no responsibility for the care of local nationals who have been affected. So what's happening now? Concerns about the health effects of the continued use of burn pits are shared by liberal and conservative groups alike. The Right to Heal Initiative advocates for more attention to the long-term harm done to both United States and Iraqi citizens as a result of the Iraq war. A class-action lawsuit is underway against KBR Inc., one of the military contractors responsible for many of the burn pits. Joseph Hickman, a former US Marine, has just released an important book entitled Burn Pits: The Poisoning of America's Soldiers. But more action is needed. The public and our elected representatives need to learn enough - and care enough -- about the shameful reality of burn pits to put an end to them. The use of incinerators, though more expensive, can and should be a requirement of our military operations. And both American military and local populations who have suffered from burn pit emissions must be compensated for the harm done to them. It's the very least we can do.